Jill Weatherholt posted last week about stepping down from the Inspy Romance blog. I am also leaving. I’ve been here from the beginning. It was a difficult decision to leave because I have enjoyed this community so much. The readers and the other authors have made this a wonderful place to share about so many things, not just books. I’m leaving because I have found it more and more difficult to reconcile the blogging schedule with my travel schedule. Although technically, my hubby still isn’t retired, he has cut way back in his business, and he can work from anywhere. So we’ve been traveling the world with at least one overseas trip each year along with many short trips around the USA. Last year we traveled every month except one. I’ve enjoyed sharing some of my travels with you. Twelve days from now we’ll be winging our way to Australia. We will spend about twenty days there and ten days in New Zealand. I’ll eventually share our trip on Facebook. If you love contemporary Christian romance for a great price, you’ll love this set of novellas for 99 cents. You can purchase it on Amazon. I share this set with five other inspirational romance authors, Kristen Ethridge, Jessica Keller, Cate Nolan, Tina Radcliffe, and Cheryl Wyatt. My novella in the set is titled: Love So Strong. Lose fifteen pounds. The words blurred as Sedona Welch stared at the small piece of paper in her hand. She took a deep breath and folded it in half. Her goal was anonymous, but she would know. And God would know. Could she keep this promise to herself? The little basket made its way down the row of folding chairs where she sat in the church’s all-purpose room. Smiling, the lady next to Sedona handed her the basket. She wished she felt as good about this as the smiling lady. Instead doubt, fear, and anxiety filled Sedona’s mind. Where was her faith? Faith that God would help. Faith that her friends would help. Faith in herself. Sedona shook away the troubling thoughts and dropped the paper into the basket. She could do this. She might have failed before, but not this time. This time would be a success. As she listened to the closing prayer, she wondered what the other ladies had put on their papers. The Bible study leader had challenged them to step out on faith and rely on God to meet the goals they had set. Maybe that was why she had failed before. She’d been relying on herself alone. As the gathering broke up, conversation buzzed around Sedona. She didn’t feel like talking as she picked up her purse and Bible. She wanted to make a hasty exit before anyone could ask her about her goal. Before she reached the door, someone called her name. Sedona turned. “I’m not sure. I’d have to think about it.” The thought of taking on another tutoring job didn’t excite Sedona. She already had a lot on her plate with the new school year just beginning and having to learn the curriculum for a new grade. And she already had one tutoring job that filled two nights each week. “Let me take you to lunch, and we can discuss it. Doug and the boys have ball practice, so I’m free.” Alyssa pushed open the door. “Sure. I’ll meet you there.” Sedona hurried off to her car and gave herself a pep talk about ordering something light. As she walked into the restaurant with its checkerboard black-and-white floors, she sent up a silent prayer. She had to get off to a good start. She slid into the booth with the faux-leather seats and smiled as Alyssa sat across from her. “I have a pretty good class so far.” Sedona studied the menu. No. The response popped into Sedona’s mind immediately, but Alyssa was her best friend. They’d been friends since they were in elementary school when Sedona was the new kid after her parents had moved to Hallburg, Maryland, outside of Baltimore. How could she expect not to share with her? As the waitress came to take their orders, Sedona looked for what she thought would be the healthiest choice. She ordered the grilled chicken when she’d rather have a burger and fries. Her better choice was a start in the right direction. “Oh wow! That’s one way to meet your new neighbor.” Sedona shook her head as the waitress delivered their food. Alyssa offered to give thanks, and Sedona bowed her head and asked for wisdom about this situation. Obviously, this child needed some guidance. Did she want to get involved? When the prayer was over, she took a bite of her chicken. It was good, but not as good as a burger and fries. “So what do you think?” Alyssa took a bite of her southwestern salad. “Mom was hoping you’d agree to talk to him. She suggested inviting you, the uncle, and the boy for dinner.” Alyssa gave Sedona a hopeful look. Sedona quizzed Alyssa about her school plans, which included online courses, but the plight of a child who had dealt with a less-than-stellar home life intruded on her thoughts, grabbing hold of Sedona and not letting go. How could she turn away from a child in need? Even though I won’t write a regular blog post here, I hope to keep in touch by posting comments and sharing the blog posts on social media whenever I can. If you haven’t “liked” my Facebook author page or signed up for my newsletter, I hope you will. All you have to do is click on the Facebook icon below my biography here or click on the word newsletter above. I always have a special giveaway with my newsletters, and I’ll have one last giveaway for this blog. I will give away a set of my Village of Hope books to one person who leaves a comment. I will draw the winner’s name at 9PM MST on September 20, 2017. Thanks for the excerpt! It sounds really good! I’ve had many wonderful teachers, though my very favorite is my English teacher in 8th grade. I had moved to a new town and was still getting adjusted to many new things. She was extremely kind and helped my reading and writing. She even invited me to a special field trip to Boston with the gifted and talented group though I wasn’t actually a part of the group. Many fond memories…. MH, you’re welcome. It’s always nice to have a teacher who takes special interest, especially when you’re the new kid. 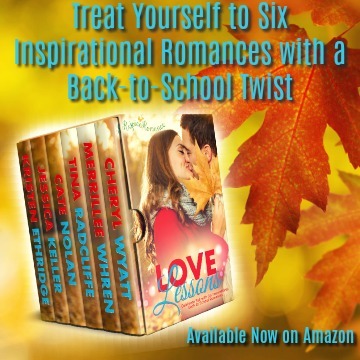 I really enjoyed all of the stories in Love Lessons boxset. You’ll be missed here at Inspy, Merrillee. Wishing you safe travels in the months and years to come. Thanks, Jill. Blessings for you in the months ahead. How exciting that you are coming to Australia to visit! Where are you going to visit while you are in this fair country? Wemble, how fantastic that your teacher inspired you to be a teacher. We are flying into Sydney where we’ll spend a few days. Then we fly to Cairns to see the Great Barrier Reef. Then we go inland to Alice Springs. From there we head to Tasmania, then Melbourne. We plan to drive the Great Ocean Road and also do some hiking in a park somewhere in that area. My hubby made all the plans, so I’m not sure of all the places. After Melbourne, we head to New Zealand, and we have several stops there and finally fly home out of Auckland. My high school science teachers were my favorite. I loved science and they encouraged it and took an interest in me. Kenneth, it’s so nice when teachers encourages students to pursue their interests. M first grade teacher inspired me to become a first grade teacher. She taught for 50 years! Iraines, you’re another one who had a teacher inspire you to become one, too. Wow! on the fifty years. I’m sad to see you go Merrrillee, but I understand. Your upcoming trip sounds amazing! As far as a favorite teacher goes the first one that came to mind was my 7th and 8th grade gym/bible teacher–I went to a private Christian school. He really encouraged me with my singing (I received a singing scholarship to college). Overall he believed in me and at that age, that is golden. I heard that he retired from teaching a year or two ago. Kimberly, that is wonderful that a teacher encouraged you and you got a scholarship. sad to hear you will be leaving, but it sounds like you are making the right choice for you and your hubby. safe travels. Will miss you; sad to hear, but certainly understand! Enjoy your travels and keep safe…and keep writing those great books I love! My favorite teacher was in 8th grade; she was such an inspiration in many ways! Thanks, Jackie. I love to hear about teachers who inspire kids. It can make all the difference in a kid’s life. Now I can’t wait until I read the rest of the story! My favorite teachers were my band director and his wife who was an English teacher. His wife gave me a love for grammar and reading. I was a personal assistant for my band director. He and his wife taught me so many things, and even “adopted” me when I was in college, sending me gifts and flowers. We named our 3rd child with his last name as our son’s middle name. His wife has since died, but we still visit him when we make a trip to my hometown. How cool that you still stay in touch with a teacher who was such an inspiration. I hope you enjoy the rest of my story and all the other stories in the set about teacher’s. Sorry to hear you are leaving. The story sounds great!! Thanks for the excerpt. I’ve had many good teachers along school it’s really hard to choose one of them..
Laura, you’re welcome. How wonderful that you had good teachers all through school. You are blessed. Thank you for all your posts here, Merrilee, I’ve enjoyed them. Your travels sound amazing. My favorite teacher was Mrs. Tunney. She poured encouragement into me in a season where I was really struggling. I will never forget that. Julie, thanks so much. Thanks for sharing about your teacher who encouraged you in a time when you were struggling. It is difficult to name a favorite teacher, as I loved all my teachers. There were many who influenced and inspired me. My mom was one of them! I am fairly new to Inspyromance and haven’t had the opportunity to get to know you, so I am sorry to see you go. I have not read any of your books, and would love to win a set of your books! Have a wonderful trip. Blessings on you. You are another who was blessed to have wonderful teachers all through school. Thanks, Autumn. You’ll see me from time to time in the comments section. Sounds like a great collection of books! Thanks for the time you’ve spent here and your words of wisdom. Would love to win and review. My sixth grade teacher was my favorite. We were a wild bunch and she had fun right along with us. Gail, sounds like a fun teacher. My favorite teacher was my first-grade teacher. I remember she did lots of special things with us including giving us seeds from oranges she brought back from a trip to Florida and helping us plant them in our milk cartons. Mine actually lived for several years in my house! I hope you enjoy your time travelling. I read one of your books recently which I enjoyed and hope to read more! Thanks cool. I’ve always wondered whether seeds from fruit we eat would grow. I’ve read all of your Village of Hope books (enjoyed each one) and also read/reviewed the novella set. I really enjoyed those because they include some of my favorite authors! As far as my favorite teacher, I had an algebra teacher for both my freshman and sophomore year who made learning fun. He always had time if anyone needed extra help and he had a wonderful sense of humor . Since math was never my strong suit, he really took the edge off for me. I also had a crush on my English teacher in my junior year, lol!! It was sad that the end of that year, he got a pink slip. He ended up taking a teaching position in California and moving his wife and young child there. Trixi, I hope you do get to NZ. I’m excited to go. We’ll miss you, Merrillee! Wish I could sneak into your suitcase and come along on your trip – visiting “Down Under” is on my bucket list. I’m glad we’ll still see you around Inspy Romance from time to time, though. Valerie, that’s what we’re doing with all this travel, fulfilling our bucket list. I’m sorry to see you go. I hope you have a great time in Australia and New Zealand. I think my favorite teacher was at a small christian school in 4-6th grades. He would read to us at the end of the day!